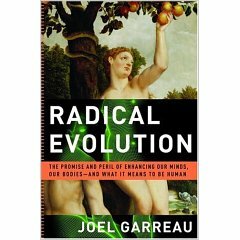 A post on Kevin Kelly's Cool Tools led me to Amazon, featuring Joel Garreau's Radical Evolution: The Promise and Peril of Enhancing our Minds, our Bodies--and What it Means to be Human (May 2005). First sentence: "This book can't begin with the tale of the telekinetic monkey." Why? Because "The gulf between what engineers are actually creating today and what ordinary readers might find believable is significant. It is the first challenge to making sense of this world unfolding before us, in which we face the biggest change in tens of thousands of years in what it means to be human." It seems to me that the fundamental categories and assumptions always go unquestioned: what's the difference between "technology" and "nature"? I still maintain that the gulf is not wide or possibly even an illusion: ants and termites have technology (they build structures that alter the environment around them; if their population grew large, they would wreak havoc on the "nature" in which they live...). And if we can do things with our minds that we did before with our bodies (for example, move an object from point A to point B), is that really altering the nature of humanity? What bugs me is that "what it means to be human" is never defined. What it means to be human to me is to think, to desire, to imagine, to be creative, to make things, to love and to hate, just to name a few. But even these are not universal and equal: certain chemical and physical variances will alter the capacity of humans to think, or to experience emotions, desire, love, hate. What is human? And what about the irony that so often this discussion of the imminent or already present radical change in what it means to be human involves a discussion of research being done--not on humans--but on animals and machines? The first telekinetic monkey that DARPA funded is named Belle. Belle is a cute monkey -- an owl monkey, tiny, with huge brown globular eyes framed in white ovals two-thirds the size of her head. Her fur is russet and gray. Belle is astonishingly quick. One of her accomplishments is her prowess at an electronic game. She intently watches a horizontal series of lights in her lab at Duke University in Durham, North Carolina. She knows that if a light suddenly shines and she moves her joystick left or right to correspond to its position, she gets a drop of fruit juice. Treats may not matter now, though. She's gotten way into the game. Belle is not really telepathic, strictly speaking. That would mean that she could communicate form her mind directly to another mind. DARPA's researchers haven't gotten that far -- yet. Although Michael Goldblatt clan clearly see how they might. Belle is telekinetic. That means that simply by thinking, she can get a mechanical arm far away -- in Massachusetts, in fact -- instantly to move exactly the way her mind commands. Her Duke researchers line up probes thinner than the finest sewing thread right next to individual neurons in different regions of Belle's motor cortex -- the part of the brain that plans movements. These are linked to two computers, one in the next room and another 600 miles north, at MIT, via the Internet. The computers each control a robotic arm. Then the researchers disconnect her joystick and start Belle's game. Sure enough, not only is she able to play it splendidly using just her thoughts, but the two robotic arms instantly mimic the motions that Belle's arm would make to control the joystick, "like dancers choreographed by the electrical impulses sparking in Belle's mind," her researchers report. The first time she did it, the two labs, in North Carolina and New England, erupted into loud celebration.